Friday morning I get a telephone call. 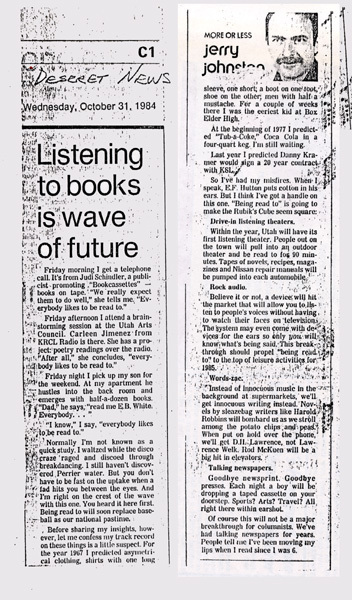 It's from Judi Schindler, a publicist promoting "Bookcassettes" -- books on tape. "We really expect them to do well," she tells me. "Everybody likes to be read to." Friday afternoon I attend a brainstorming session at the Utah Arts Council. Carleen Jimenez from KRCL Radio is there. She has a project: poetry readings over the radio. "After all," she concludes, "everybody likes to be read to." Friady night I pick up my son for the weekend. At my apartment he hustles into the back room and emerges with half-a-dozen books. "Dad," he says, "read me E.B. White. Everybody..."
"I know," I say, "everybody likes to be read to." Normally I'm not known as a quick study. I waltzed while the disco craze raged and discoed through breakdancing. I still haven't discovered Perrier water. But you don't have to be fast on the uptake when a fad hits you between the eyes. And I'm right on the crest of the wave with this one. You heard it here first. Being read to will soon replace baseball as our national pastime. Before sharing my insights, however, let me confess my track record on these things is a little suspect. For the year 1967 I predicted assymetrical clothing, shirts with one long sleeve, one short; a boot on one foot, shoe on the other; men with half a mustache. For a couple of weeks there I was the eeriest kid at Box Elder High. At the beginning of 1977 I predicted "Tub-a-Coke," Coca Cola in a four-quart keg. I'm still waiting. Last year I predicted Danny Kramer would sign a 20 year contract with KSL. So I've had my misfires. When I speak, E.F. Hutton puts cotton in his ears. But I think I've got a handle on this one. "Being read to" is going to make the Rubik's Cube seem square. Within the year, Utah will have its first listening theater. People out on the town will pull into an outdoor theater and be read to for 90 minutes. Tapes of novels, recipes, magazines and Nissan repair manuals will be pumped into each automobile. Believe it or not, a device will hit the market that will allow you to listen to people's voices without having to watch their faces on television. The system may even come with devices for the ears so only you will know what's being said. This breakthrough should propel "being read to" to the top of leisure activities for 1985. Instead of innocuous music in the background at supermarkets, we'll get innocuous writing instead. Novels by sleazebag writers like Harold Robbins will bombard us as we stroll among the potato chips and peas. When put on hold over the phone, we'll get D.H. Lawrence, not Lawrence Welk. Rod McKuen will be a big hit in elevators. Goodbye newsprint. Goodbye presses. Each night a boy will be dropping a taped cassette on your doorstep. Sports? Arts? Travel? All right there within earshot. Of course this will not be a major breakthrough for columnists. We've had talking newspapers for years. People tell me I've been moving my lips when I read since I was 6.